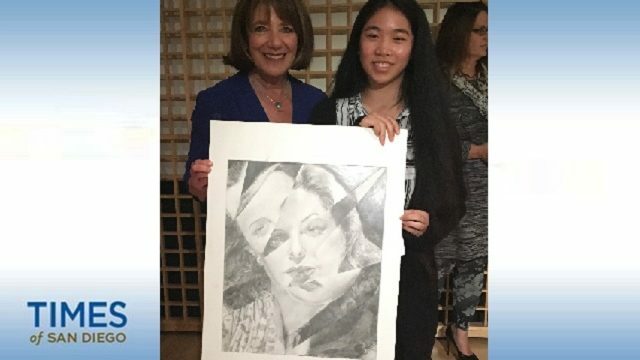 A high school student from the San Diego School of Creative and Performing Arts beat out 50 other contenders all vying to have their works showcased in the U.S. Capitol Building. Jenny Nguyen’s piece, “Timeless Distortion,” will hang in the Cannon Tunnel of the U.S. Capitol Building, it was announced Thursday. Nguyen was among the artists competing in Rep. Susan Davis’ (D-San Diego) districtwide 2018 Congressional Art Competition. In addition to having her work displayed in the nation’s Capitol, Nguyen will have an opportunity to attend a ceremony in Washington as her piece and the other winners across the country are displayed. Since 1982, members of the House of Representatives have held art competitions — known as Artistic Discovery — for high school students in their congressional districts. The 51 entries from Davis’ district were judged by Cynthia Kosciuczyk and William Virchis. Kosciuczyk is a local artist and author who owned a gallery on Adams Avenue and is a member of the Normal Heights Cultural Council. Virchis is the former director of Visual and Performing Arts at the Sweetwater Union High School District and previously served as professor and artistic director at Southwestern College.